Cloudy this morning with showers during the afternoon. High near 45F. Winds WSW at 5 to 10 mph. 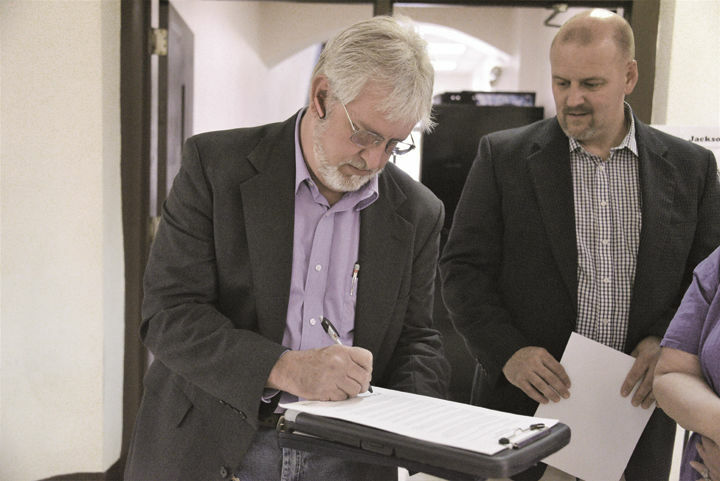 Chance of rain 50%..
On April 2nd 2019 at the Jackson County Courthouse, McKee Mayor John Tompkins and Jackson County Judge Executive Shane Gabbard, each signed a proclamation declaring April 2nd 2019 as National Service Day in McKee and in Jackson County to highlight the impact of national service in tackling local issues. They were joined by Sheriff Paul Hays and County Clerk Donald “Duck” Moore to honor the volunteers serving in Jackson County. The Day of Recognition for National Service is a nationwide bipartisan effort to recognize the positive impact of national service in counties, to thank those who serve, and to encourage citizens to give back to their communities. The day is sponsored by the Corporation for National and Community Service (CNCS), the National League of Cities, the National Association of Counties, and Cities of Service. Judge Gabbard remarked, “As Jackson County Judge Executive, I am grateful for the dedication and sacrifice of these every day heroes, who are helping make our great county stronger, safer, and healthier. I have seen their impact first-hand, and know that national service is a cost-effective strategy to meet critical community needs. That’s why I am pleased to join local leaders across the country today in celebrating National Service Recognition Day. We are talking time to recognize the impact of national service and thank those who serve. The mission of the Corporation for National and Community Service (CNCS) is to improve lives, strengthen communities, and foster civic engagement through service and volunteering. That sums up perfectly what this day of Recognition for National Service is all about. 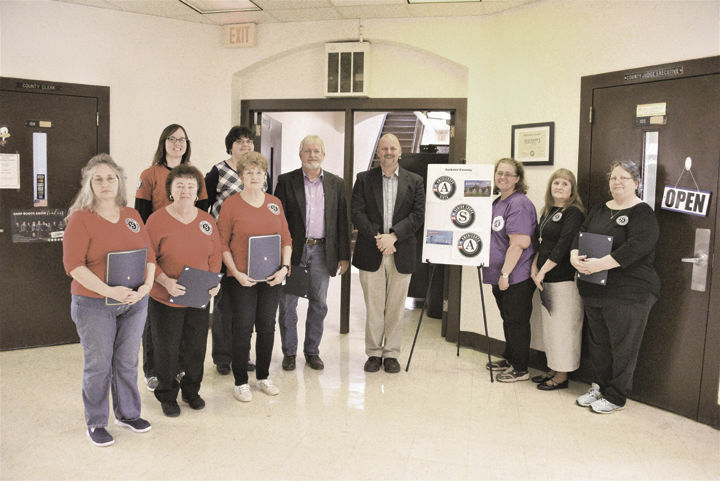 Tompkins, Gabbard, Hays and Moore joined the over 5200 officials across the United States that are participating in National Service Day events. They are recognizing the current 12 volunteer members of AmeriCorps and Senior Corps serving in Jackson County. Tyner, Sand Gap and McKee elementary schools have 8 Foster Grandparents (also known affectionately as Grannies and Grandpas), that help students learn to read and provide one on one tutoring for Save the Children. The Foster Grandparents at Tyner are Mary Collins, Jackie Jackson and Elsie Ward, at McKee they are Brenda Brewer, Cleo Reed, and Patty Rice, at Sand Gap they are Gladys Hammond and Paul Johnson. There is one AmeriCorps VISTA working with Save the Children that serves as Community Engagement liaison for Jackson County. Virgie Moore serves the community from the Board of Education. She helps create and promote events and Playgroups to increase Kindergarten Ready Awareness, Literacy and Reading on Grade Level and to give parents the tools and skills needed to help children to succeed in all things. She is also the VISTA leader overseeing six VISTAs serving in other counties. Three AmeriCorps Members serve Jackson County at Christian Appalachian Project (CAP) through a variety of programs. Ruth Davis visits local homebound seniors and provides transportation to medical and other appointments, helping participants remain in their homes longer. Jessica Janczewski serves at CAP’s Camp AJ. Steve Taflinger serves in our home repair program, providing home repairs for families in need and the elderly throughout the county, helping to make homes safe, warm, dry, and accessible. National service and volunteerism shows the best of the American spirit – people turning toward problems instead of away, working together to find community solutions. In Kentucky CNCS has more than 6400 volunteers serving in over 900 locations.